Home About Us Expertise People Locations Careers More ..
With a view to annually reducing by 5 percent fatal labor accidents in the next five years, the Prime Minister on January 5 approved the National Program on occupational safety and health (OSH) for 2016-2020 period. Under Decision No. 05/QD-TTg, the nation will strive to have more than half of total employees working in establishments vulnerable to common occupational diseases having medical check-ups to detect occupational diseases. In addition, over 70 percent of large-sized enterprises and 30 percent of medium- and small-sized enterprises whose employees are at risk of occupational diseases will be able to carry out the observation of the working environment. 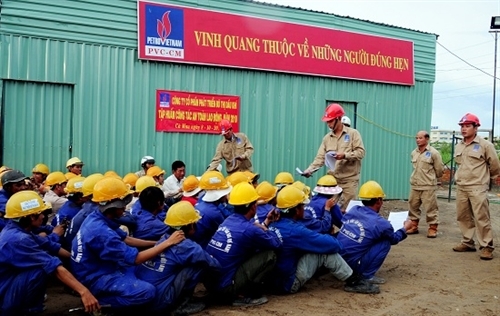 The program also targets to provide OSH training to over 80 percent of laborers engaged in occupations or doing jobs subject to strict OSH requirements; 80 percent of OSH officers and medical workers; and 90 percent of cleaners of production and business establishments. Principal activities covered by the program include reviewing, amending and supplementing legal documents, standards and technical regulations on OSH; increasing the capacity and efficiency of the state management of OSH; improving occupational health operations and healthcare services for employees at workplaces; and propagandizing, educating, training and providing advices to employers and employees in OSH. At the same time, the program will apply appropriate OSH control systems in enterprises, production and business establishments and traditional craft villages with high risk of labor accidents and occupational diseases.